© Tiftikci and Serbest; Licensee Bentham Open. The aim of this study was to show the effects on the meniscus of repair applied from the femoral, the femoral-tibial and the tibial surfaces. In the treatment of meniscocapsular separation, although the accepted gold standard technique in the past was the inside-out suture technique, the current treatment method is all-inside repair methods. The all-inside techniques include the hook method and applications with a meniscus suture device. The hook method is difficult with a steep learning curve. In meniscus repair applied with the all-inside meniscus devices, the application of the suture can change the anatomic structure and position of the meniscus. The suturing method applied from the tibial section of the meniscus does not disrupt the anatomic position of the meniscus in meniscocapsular separation. Thus, the optimum conditions are provided for restoration of the functions of the meniscus. The optimal repair in meniscocapsular separations can be considered to be that made with sutures from the tibial section of the meniscus. This technique may be helpful in obtaining better clinical results. Keywords: All-inside, Knee, Meniscus, Meniscal sutures, Meniscocapsular separation. Meniscocapsular injuries are most often seen in the posterior horn section of the meniscus and just as this could be the result of micro-trauma, they generally accompany to anterior cruciate ligament tear [1-3]. The detection of meniscocapsular injuries can be difficult in arthroscopy and treatment is generally neglected. Sonnery et al. recommended minimum debridement of meniscocapsular synovium for diagnosis of occult meniscocapsular separation. Although inside-out techniques are the gold standard in the management of meniscocapsular separation and meniscal tear close to the capsule, current practice uses all-inside suture techniques. Methods defined for suturing include suturing with the all-inside hook method from the posterior medial portal. This method requires experience [1, 5]. In meniscocapsular separation and meniscal tear close to the capsule, the advantage of suturing with all-inside devices is the ease of application [6, 7]. However, care should elevation of the meniscus. With femoral side elevation, the normal anatomic placement is lost and the meniscus functions may not be able to be fully restored. In patients with clinical femoral side elevation of the meniscus, this causes feelings of tension or pulling in the area to be sutured. The aim of this study was to describe how the all-inside suture should be placed without disturbing the normal anatomic placement of the meniscus. The patient is placed into the classic supine position for arthroscopy. Generally, the procedure is applied under spinal anesthesia with a lower extremity tourniquet and routine surgical preparation and antisepsis. With the knee in 90° flexion, arthroscopy is started by forming anterolateral and anteromedial portals. A camera is placed at an angle of 30° to the anterolateral portal and diagnostic arthroscopy is applied. In posterocapsular tears of the medial meniscus, the anteromedial portal on the same sideshould be used for suturing, and in tears extending towards the meniscus body, the anterolateral portal. The same method can be used for sutures in the lateral meniscus. The RapidLoc (Mitek, Norwood, MA, USA) all-inside suture instrument was used for the meniscus repairs. A peek anchor for the first suture is advanced by passing the meniscus suture device from the intact meniscus tissue and the capsule on the femoral surface of the meniscus. Then, a second peek anchor is advanced from 5-10 mm lateral or medial. By pulling the self locking suture thread, the meniscus tissue is tightly sutured to the capsular section. Thus, the meniscal tissue in the all inside suture materials which is not appropriately positioned is elevated in the femoral direction. This is caused by the anatomic structure of the meniscus with femoral translation of the peek anchor of the suture from the femoral surface of the meniscus while placing the suture (Fig. 1). A. Meniscocapsular separation repair for abnormal anatomic placement causing femoral elevation. A peek anchor for the first suture is advanced by passing the meniscus suture device from the intact meniscus tissue and the capsule on the tibial surface of the meniscus. Then, a second peek anchor is advanced from 5-10 mm lateral or medial. By pulling the self-locking suture thread, the meniscus tissue is tightly sutured to the capsular section. Then for the second suture, a peek anchor is advanced by passing the meniscus suture device from the intact meniscus tissue and the capsule on the femoral surface of the meniscus, followed again by a second peek anchor advanced from 5-10 mm lateral or medial. By pulling the self-locking suture thread, the meniscus tissue is tightly sutured to the capsular section. Application in this way will partially disrupt the anatomic form of the meniscus as 2 or more all-inside suture devices are required regardless of the size of the tear (Fig. 2). B. Meniscocapsular separation repair for normal anatomic placement. A peek anchor for first suture is advanced by passing the meniscus suture device from the intact meniscus tissue and the capsule on the tibial surface of the meniscus. Then, a second peek anchor is advanced from 5-10 mm lateral or medial. By pulling the self-locking suture thread, the meniscus tissue is tightly sutured to the capsular section. In large tears, the repair can be strengthened with 2 or 3 sutures. All-inside sutures placed in this position do not disrupt the anatomic position of the meniscus (Fig. 3). C. Meniscocapsular separation repair for near-normal anatomic placement. The meniscus has functional importance in respect of load transmission in the knees, stability, shock absorption, proprioception, protection of the joint cartilage and lubrication . There is universal consensus regarding preserving the meniscus among orthopedic surgeons. The meniscocapsular region has good healing potential due an abundant blood supply. Different suturing techniques have been described in literature, including inside-out, outside-in and all-inside [9, 10]. Meniscocapsular separation occurs in the tibial part of the meniscus. Most meniscocapsular separations are seen together with micro-trauma and ACL tears. With increasing severity of trauma, a longitudinal separation pattern develops [2, 3]. Inside-out repair of meniscal tears is the gold standard in respect of biomechanical strength. As the needle diameter is small in the application of this technique, there is less damage to the meniscus. 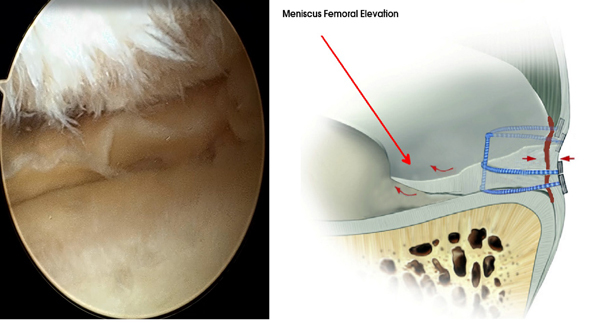 In addition, as the meniscus is biomechanically fixed to the capsule in a circular manner, it does not cause femoral elevation of the meniscus. However, the need for posteromedial and posterolateral incisions is a disadvantage [11-15]. Rapid technological advances in recent years have rendered the application of all-inside meniscus suture materials simple and safe. In new generation all-inside repair devices, there are woven, polyester sutures which are self-adjusting according to the implant. These sutures are as resistant biomechanically as inside-out sutures, and provide the possibility of horizontal, longitudinal, oblique or vertical application in whichever direction is required. In literature it has been reported that there is the disadvantage of neurovascular injuries and unsuitability for the anterior meniscus. The most significant complication of the all-inside suture technique is neurovascular injury. New generation suturing devices have a stopping mechanism to prevent neurovascular injury. In meniscocapsular separation, an additional portal is rarely needed and it allows the use without any need for open surgical techniques [7, 16, 17]. All-inside procedures have been long used in our clinic and no neurovascular complications have been observed in any patient. It has been reported that sutures applied to the capsule cause discomfort after repair by all-inside devices. This could be due to inappropriate suture anchor placement. In our previous applications, patients experienced feelings of tension and pulling, but now, using the suturing technique applied from the tibial surface of the meniscus as here described, no problems of feeling postoperative tension or pulling have been developed in any patients. In conclusion, the suturing method applied from the tibial section of the meniscus does not disrupt the anatomic position of the meniscus in meniscocapsular separation. Thus, the optimum conditions are provided for restoration of the functions of the meniscus. This technique may be helpful in obtaining better clinical results. SS and UT performed the technique, wrote the manuscript. SS, UT contributed to the discussion and reviewed/edited the manuscript and researched data. SS, UT helped to draft the manuscript. SS, UT researched data and contributed to discussion. All authors read and approved the final manuscript. Liu X, Feng H, Zhang H, Hong L, Wang XS, Zhang J. Arthroscopic prevalence of ramp lesion in 868 patients with anterior cruciate ligament injury. Am J Sports Med 2011; 39(4): 832-7. Bollen SR. Posteromedial meniscocapsular injury associated with rupture of the anterior cruciate ligament: a previously unrecognised association. J Bone Joint Surg Br 2010; 92(2): 222-3. Ahn JH, Bae TS, Kang KS, Kang SY, Lee SH. Longitudinal tear of the medial meniscus posterior horn in the anterior cruciate ligament-deficient knee significantly influences anterior stability. Am J Sports Med 2011; 39(10): 2187-93. Sonnery-Cottet B, Conteduca J, Thaunat M, Gunepin FX, Seil R. Hidden lesions of the posterior horn of the medial meniscus: a systematic arthroscopic exploration of the concealed portion of the knee. Am J Sports Med 2014; 42(4): 921-6. Park IS, Kim SJ. New meniscus repair technique for peripheral tears near the posterior tibial attachment of the posterior horn of the medial meniscus. Arthroscopy 2006; 22: 908-e14. Li WP, Chen Z, Song B, Yang R, Tan W. The fast-fix repair technique for ramp lesion of the medial meniscus. Knee Surg Relat Res 2015; 27(1): 56-60. Espejo-Baena A, Figueroa-Mata A, Serrano-Fernández J, de la Torre-Solís F. All-inside suture technique using anterior portals in posterior horn tears of lateral meniscus. Arthroscopy 2008; 24: 369-e1-4. Renström P, Johnson RJ. Anatomy and biomechanics of the menisci. Clin Sports Med 1990; 9(3): 523-38. Papalia R, Vasta S, Franceschi F, D’Adamio S, Maffulli N, Denaro V. Meniscal root tears: from basic science to ultimate surgery. Br Med Bull 2013; 106: 91-115. Ayeni O, Peterson D, Chan K, Javidan A, Gandhi R. Suture repair versus arrow repair for symptomatic meniscus tears of the knee: a systematic review. J Knee Surg 2012; 25(5): 397-402. Post WR, Akers SR, Kish V. Load to failure of common meniscal repair techniques: effects of suture technique and suture material. Arthroscopy 1997; 13(6): 731-6. Rimmer MG, Nawana NS, Keene GC, Pearcy MJ. Failure strengths of different meniscal suturing techniques. Arthroscopy 1995; 11(2): 146-50. DeHaven KE. Meniscus repair. Am J Sports Med 1999; 27(2): 242-50. Noyes FR, Barber-Westin SD. Repair of complex and avascular meniscal tears and meniscal transplantation. J Bone Joint Surg Am 2010; 92(4): 1012-29. Noyes FR, Barber-Westin SD. Management of meniscus tears that extend into the avascular region. Clin Sports Med 2012; 31(1): 65-90. Ahn JH, Kim SH, Yoo JC, Wang JH. All-inside suture technique using two posteromedial portals in a medial meniscus posterior horn tear. Arthroscopy 2004; 20(1): 101-8. Morgan CD. The “all-inside” meniscus repair. Arthroscopy 1991; 7(1): 120-5.